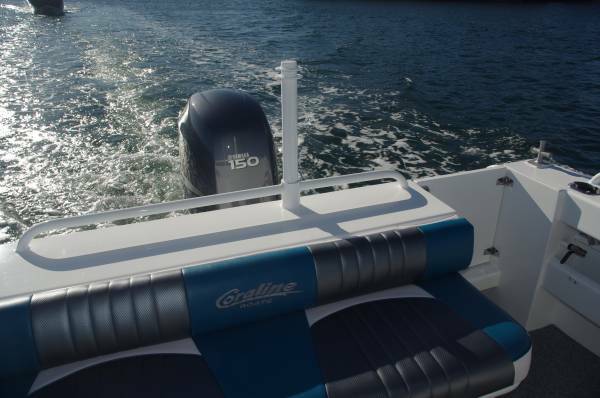 The hull of the Coraline 580 Ocean Runner has the re-design common to many of the brand’s newer models: more deadrise, and reverse chines to balance the low down buoyancy the extra deadrise delivers. And the design work shows. Ride is noticeably better than the typical me-too plate aluminium boat. The 580 is fore cabin plus hardtop-style, with a cabin on the short size to give a big cockpit. You could fit a toilet in it, and children could sleep in there. The standard door is fabric, but the review boat had a lockable aluminium door – a comfort in roadhouse forecourts and camping grounds. Should adults want to sleep on board, the cockpit deck has plenty of area for swags or air beds. 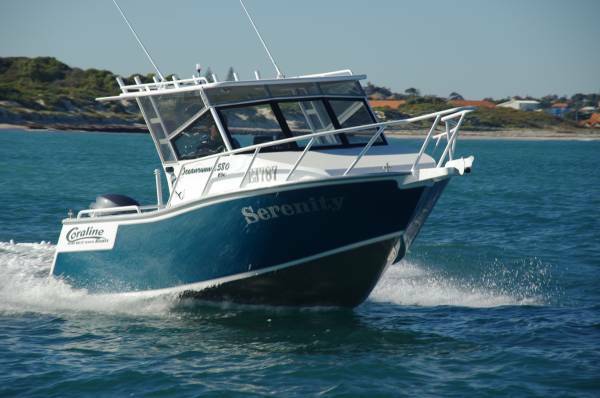 This is a combined family and fishing boat with fittings to match. A ski pole drops into a transom socket, and another pair of sockets in the port coaming accepts a choice of barbecue or bait board. The under deck locker could be for bulk dry storage – you could fit scuba gear in it – an ice slurry catch tank, or even a ballast tank for extra steadiness at rest. You would only consider the last with a big load on board as this is a particularly stable boat. The sun protection provided would be welcome whatever you use you make of the boat. The only part of the cockpit not shaded by the hardtop is taken care of by the cantilevered fabric extension. It is an open style hardtop, with the air gap above the glass fitted with clears. The top’s support, an extension of the windscreen frame, identifies the 580 as a Coraline just as clearly as the name painted on the side. It is extravagantly strong. The glass is surface mounted on the frame TransPerth bus style, practically removing the possibility of frame corrosion. One of the many advantages a hardtop has over a soft one is ease of going forward: you get solid handholds. The 580 couples rooftop grab rails with large section functional side rails, and puts side decks between them wide enough for easy transit. When you get forward you have the use of a great fishing spot perched on the cabin roof. 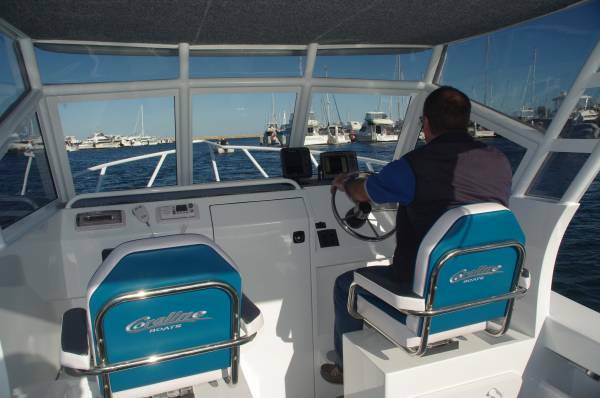 For spacious fishing the rear lounge – a three to four seater – is removable. You could temporarily fit it in the cabin or stow it on the virtual roof rack of the hardtop. The two permanent seats at the cockpit’s other end, like the lounge, have upholstery colour coordinated with the paintwork and the carpet. Probably more importantly, they are very comfortable too. They swivel and slide on locker boxes that extend out to the boat’s sides and have oddment trays recessed into their tops. With a typical Coraline touch the trays are carpet lined to reduce scratching and noise. The dash top gets carpet too, and a near full-beam grab rail that also acts as a fiddle rail for more oddments. Rails are a recurring feature on this boat: wherever you sit or stand there is something to hang on to. The review boat had the de rigueur stereo outfit, plus a set of fishing electronics. There is plenty of dash space for flush mounted screens, but the choice of top mounted meant little eye movement between looking out and looking at them, yet without obstructing the horizon. 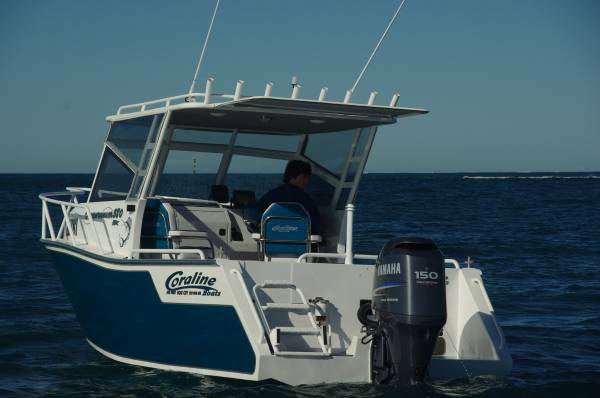 Our 580 had the most powerful recommended motor, a 150hp Yamaha four-stroke. Go down to a 115 two-stroke and your pocket would be happier to the tune of $9,000. There would still be plenty of performance on tap although you might have the nagging thought of how much of that $9,000 would be yours at resale time: big two-strokes are unfashionable. 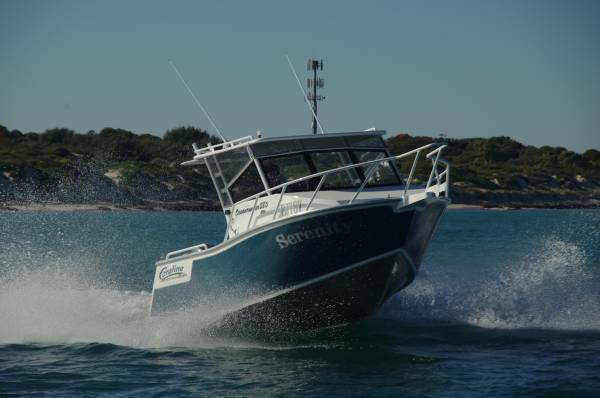 150hp was good for 37 knots, about 15 more than typical cruising speed but certainly useable on the gentle review day. Acceleration was sports car standard, as was the cornering, and a lot of fun would be available on river days; you could launch a pair of skiers with this one.